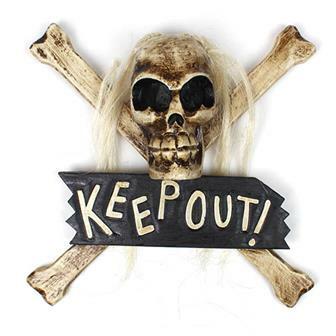 This fine collection of Fair Trade carved wooden wall plaques, decorative signs, handmade wall art, masks and inspirational pieces is sure to contain the perfect piece decorate your home, garden or office. 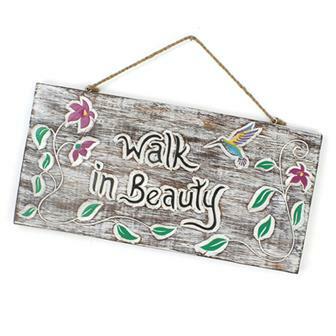 Our plaques are made by skilled artisans from Bali which has a long tradition of fine woodcarving. 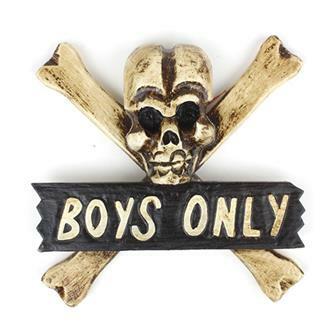 Small solid wooden decorated skull and cross bones door plaque for "Boys Only"
Small wooden decorated skull and cross bones door plaque for "Girls Only", this item may come with scary faux hair. 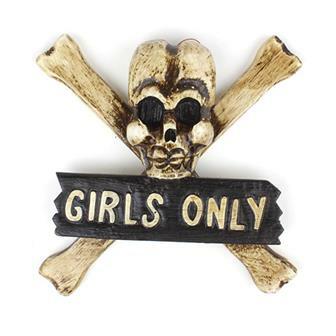 Charmingly direct and to the point, keep people out with this fearsome skull and crossbones plaque. Featuring a head of whitened hair and a loop for ease of hanging. 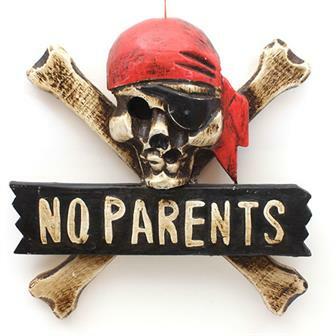 Arr, matey, keep them land lubbing parents out of yer room with this skull and crossbones pirate plaque. Supplied with a loop on the back for easy hanging. 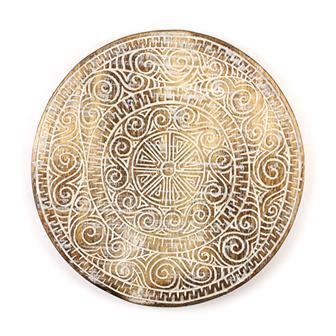 These attractive pieces of wall art have been intricately carved and etched in a style reminiscent of traditional Timor tribal art. Each round plaque is complete with a hanging hook on the reverse. 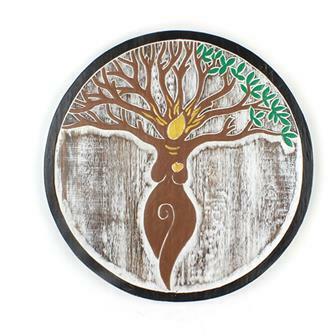 These bright and beautiful tree of life carved wooden wall plaques are hand carved and painted in Indonesia. 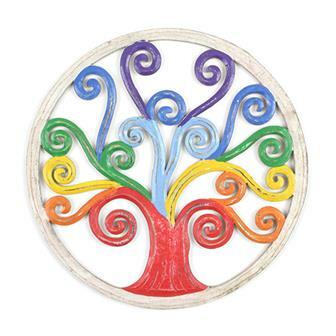 Each cheery piece of wall art features flowing branches that spiral at the ends and a bright rainbow mix of colours. 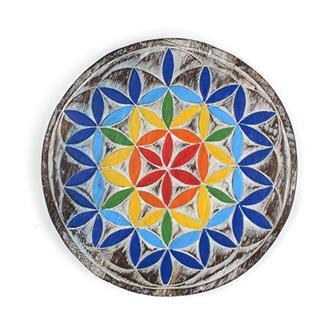 Beautiful and intricate Flower of Life plaque from Bali, Indonesia. The Flower of Life is a complex, ancient symbol made from many overlapping circles. These symbols are now used in The New Age movement as an example of sacred geometry. 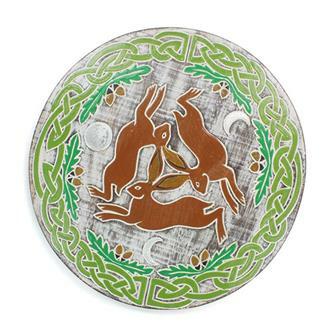 A delightful, thick, rustic wooden plaque which has been intricately carved with a special Celtic knot design. The design, by Canadian artist Cari Buziak, combines a selection of different knots and interweaving patterns to form the shape of a tree. This plaque is then painted with a lovely medley of green shades to add to the verdant feel of this piece. 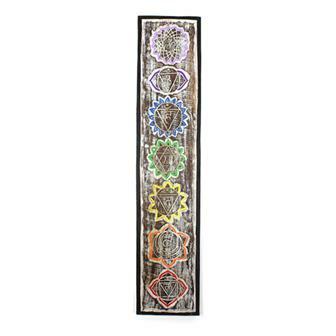 These fantastic plaques show the positions of the seven sacred Chakras in a meditative position. Featuring an artfully aged finish, these beautiful pieces make wonderful meditation aids and great gifts. 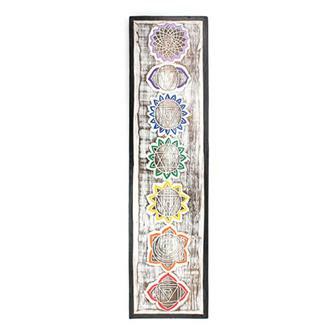 This beautiful, handmade, wooden chakra plaque wonderfully displays the seven chakra symbols. Each one has been carefully carved and hand painted and the whole thing has been given a great rustic finish. 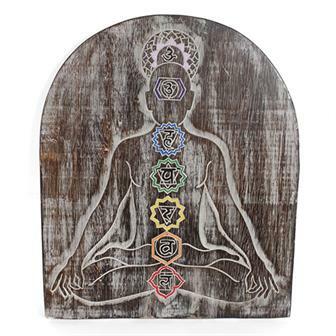 A fantastic meditation tool to assist in balancing your chakras and a wonderful gift. Slightly smaller than our long chakra plaques, these solid wood chakra plaque wonderfully display the seven chakra symbols. Each one has been carefully carved and hand painted and the whole thing has been given a great rustic finish. A fantastic meditation tool to assist in balancing your chakras and a wonderful gift. Also known as the Hamsa, the Hand of Fatima is a popular symbol in the Middle East and northern Africa, particularly in Islamic and Jewish traditions. 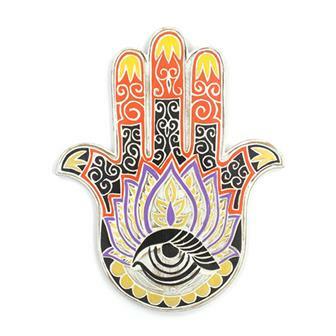 The hand is associated with good luck, protection and peace. 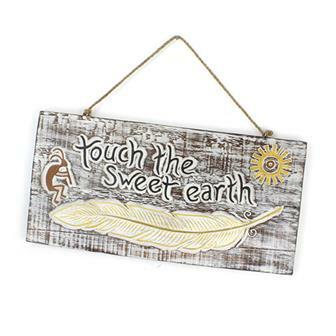 This charmingly rustic hand made plaque has been etched with the message: "Touch The Sweet Earth" and a beautiful feather. Completed with a thick twine cord, this wonderful hanging is perfect for displaying on any wall, door, shed or tree. 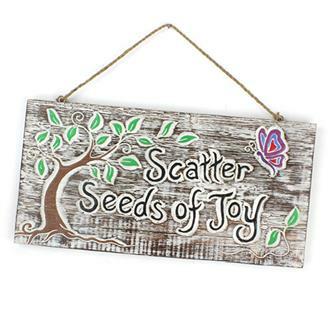 This charmingly rustic hand made plaque has been etched with the message: "Scatter Seeds of Joy" and a green tree and little butterfly. Completed with a thick twine cord, this wonderful hanging is perfect for displaying on any wall, door, shed or tree. 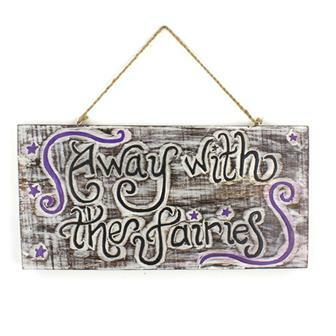 This solid wooden plaque has been hand etched and painted with the inscription: "The Witch's Garden. Magic Begins Here." Each plaque is finished in a charming rustic style and each has a thick twine cord attached for easy hanging on any wall, door, shed or tree.